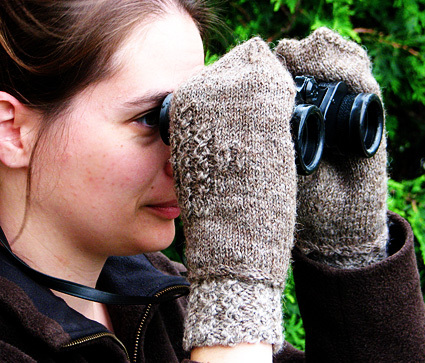 Have silky wrist warmers and sturdy mittens, too, all from the same Shetland fleece. Use the variation in the fiber of this ancient sheep breed to spin yarns exactly suited to the demands of your mittens. (To learn how to process a Shetland fleece, see article Sinclair's Search for a "Kindly" Shetland Sheep.) Wear your wrist warmers alone for some toastiness on a cold day or slip the sturdy, cropped mittens over them for extra warmth. 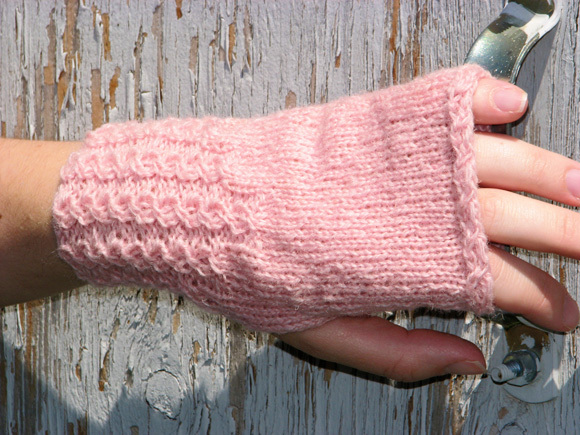 Invisible hooks and bars join the mittens when they are worn together and fade into the background when the wrist warmers are worn separately. RT (Right Twist): When worked on RS row, slip next st to cable needle and hold to back of work, k1 from left needle, k1 from cable needle. When worked on WS row, slip next st to cable needle and hold to back of work, p1 from left needle, p1 from cable needle. RPT (Right Purl Twist): Slip next st to cable needle and hold to back of work, k1 from left needle, p1 from cable needle. LPT (Left Purl Twist): Slip next st to cable needle and hold to front of work, p1 from left needle, k1 from cable needle. RPT Join: Slip next st to cable needle and hold to back of work, k1 from left needle, p st from cable needle together with st from wristwarmer or mitten. ssp: Slip next 2 sts knitwise, one at a time, to right needle. Slip them both, purlwise, back to left needle. Purl them together through their back loops. Instructions for Blanket Stitch can be found here. Chart: Click here to see the charts; they will print on a single letter-sized page. Using larger needles, CO 50 sts. 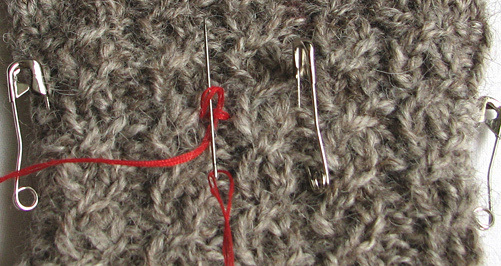 Divide sts between needles and join to begin working in the round, being careful not to twist. If desired, after a few rounds have been worked, place safety pin or split ring marker to indicate beginning of round. Work Rounds 1-4 of Chart A five times. 20 rounds have been worked. Hand is worked differently for right and left wristwarmers. Next round establishes pattern for hand. Next Round: Work Row 1 of Chart B over first 26 sts, place marker, k24. 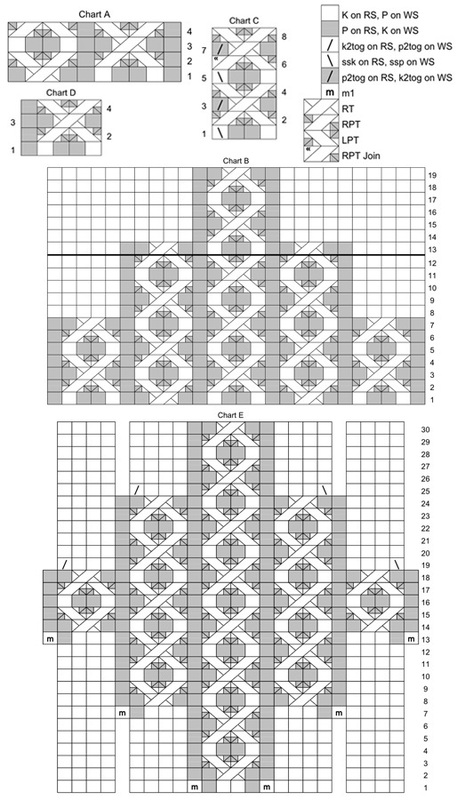 This round sets pattern for left hand: Chart B is worked over first 26 sts, remaining sts are worked in stockinette st.
P first st of next round from first needle of round onto last needle of round. This point will now be beginning of round; move end-of-round marker accordingly. Next Round: K24, place marker, work Row 1 of Chart B over last 26 sts. This round sets pattern for right hand: First 24 sts are worked in stockinette st, Chart B is worked over remaining 26 sts. Work 11 more rounds in pattern as set. You will have just completed Row 12 of Chart B. Turn work so that WS is facing. Work 12 rows back and forth, forming a thumb opening; when all rows of Chart B have been worked, remove marker and work these sts in stockinette st.
At end of last row (a RS row), join work to resume working in the round. Upper hand shaping is worked differently for right and left wristwarmers. Next Round: K24, k2tog, k to last 2 sts, ssk. 2 sts decreased. Repeat these 4 rounds three times more. 42 sts. Next Round: K2tog, k22, ssk, place marker, k24. 48 sts. Next Round: K2tog, k to 2 sts before marker, ssk, k to end. Repeat these 4 rounds twice more. 42 sts. Continue in stockinette st until work measures 5 inches from top of cuff, measured along center of palm. Next Round: [K4, k2tog] seven times. 35 sts. Break yarn. Using smaller needle and Crochet Cast On method, CO 4 sts. Turn these sts so that WS is facing. Slip first st of wristwarmer to beginning of needle holding newly cast on sts; ssp (first st of wristwarmer worked together with first st of edging), k2, p1. This counts as Row 1 of Chart C.
Continue working sts of edging following Chart C, joining to sts of wristwarmer at beginning of each WS row and at end of chart row 6 as indicated, until all sts of wristwarmer have been joined. Break yarn, leaving a tail approx. 8 inches long. Carefully remove waste yarn from CO edge of edging, placing resulting live sts on a smaller double-point needle. Graft to sts at end of edging. Join yarn at base of thumb opening. Crochet around opening, working 1 slip st in each row. Fasten off. Using larger needle and Crochet Cast On method, CO 5 sts, leaving a tail approx. 8 inches long. Note: When working from Chart D, note that odd-numbered rows are WS rows. Work Rows 1-4 of Chart D 13 times. 52 rows have been worked. Leaving working yarn attached, carefully remove waste yarn from CO edge and place resulting live sts on double-point needle. Form cuff into a loop, ensuring that work is not twisted. Use yarn tail to graft sts at CO end of cuff to sts of last row worked. Using larger double-point needles and attached yarn, with RS facing, pick up and k 44 sts along edge of cuff formed by single column of p sts – this will be slightly more than 4 sts picked up for every 5 rows. If desired, place safety pin or split ring marker to indicate beginning of round. 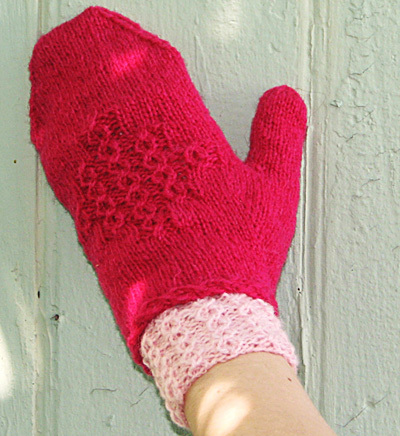 Hand is worked differently for right and left mittens. Next round establishes placement of thumb gusset. Next Round: K to last st, place marker, m1, k1, m1, place marker. 46 sts. Next Round: K22, place marker, m1, k1, m1, place marker, k21. 46 sts. Repeat these 2 rounds five times more. 58 sts; 15 sts between markers. Note: Read ahead! Gusset shaping directions and stitch pattern directions and shaping directions are worked at the same time, beginning on the next round. Continue shaping thumb gusset as set, working increase round every second round, twice more. 19 sts between markers. Work 8 rounds over all sts without increasing further. Next Round: Work in pattern to first marker, remove marker, [k1 for left hand] or [k2 for right hand], place next 16 sts on hold on waste yarn, turn work so that WS is facing and use cable cast on technique to CO 4 sts, turn work back to RS and join to continue working in the round, [k2 for left hand] or [k1 for right hand], remove marker, k to end of round. Next Round: K1, work Round 1 of Chart E, increasing as shown, k to end of round. This round establishes placement of Chart E for hand. As you work thumb gusset and upper hand as directed, continue working Chart E as set, increasing and decreasing as shown. When last round of Chart E is complete, work these sts in stockinette st. When gusset shaping and chart are complete, there will be a total of 52 sts. Continue in stockinette st until work measures 6 inches from top of cuff, or 1.5 inches less than desired length to tip of longest finger. Next round is worked differently for right and left hands. Next Round: K24, place marker, k26; do not work last 2 sts. Repoition sts so that this is now beginning of round. K28, place marker, k to end of round, k first 2 sts of next round. Reposition sts so that this point is now beginning of round. Round is divided into two halves of 26 sts each. Decrease Round: Ssk, k to 2 sts before marker, k2tog, slip marker, ssk, k to last 2 sts, k2tog. 4 sts decreased. Repeat these 2 rounds 6 times more. 24 sts. Place first 12 sts on one needle, and remaining 12 sts on another needle. Graft sts together. 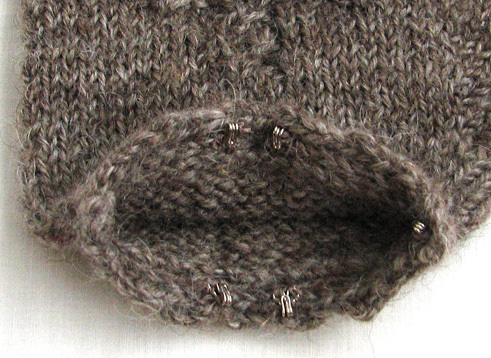 Place held sts of thumb on larger needles. K all sts, then pick up and k 3 sts in CO edge at point where thumb meets hand. 19 sts. Next Round: K17, k2tog. 18 sts. 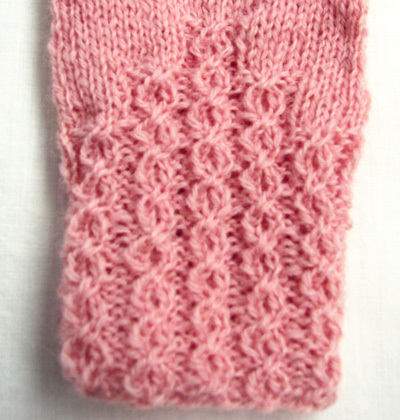 Work in stockinette st until thumb measures 2 inches from picked-up sts, or desired length to tip of thumb. Next Round: [K2tog] to end. 9 sts. K 1 round. Break yarn, leaving a tail approx. 6 inches long. Thread tail through yarn needle, draw through all sts and pull tight. Weave in end securely. 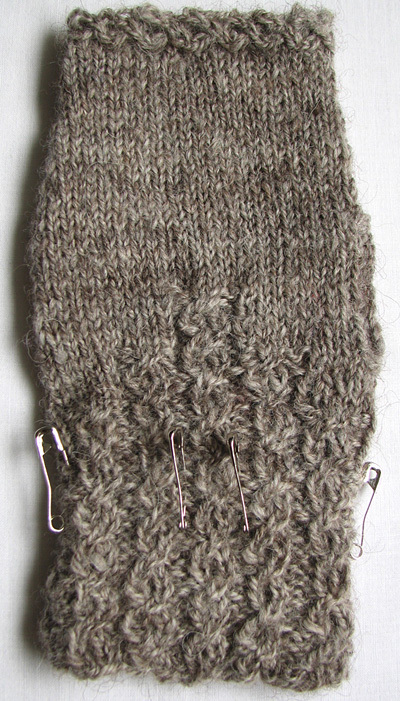 Mark six points evenly spaced around cuff of wristwarmer, placed in purl ribs between cables. Form loop: Cut a piece of sewing thread approximately 1 yard long. Fold it in half and thread doubled thread through the needle, knotting the ends. Bring the needle up through the fabric near the top of the cuff, stitching through a strand of yarn. Reinforce the loop with blanket stitch: Bring the thread up in front of the thread bar. Place the needle under the thread bar but not through the cuff, leaving a loop. Pass the needle through the loop. Continue until the thread loop is completely covered. Repeat at each marked column of stitches. 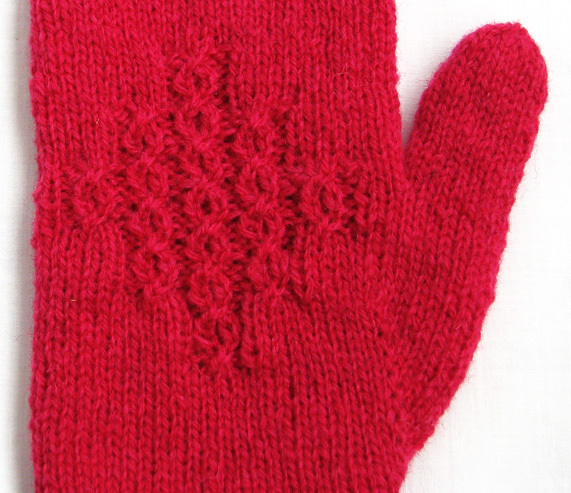 Mark positions on inner edge of mitten cuff to correspond to loops on wristwarmer cuff. Sew hooks to inside of cuff, using photo as guide. Lisa Jacobs discovered hand spinning at the age of nine when her grandmother taught her to use a drop spindle. After running out of fiber and trying unsuccessfully to spin cotton balls, she put her spindle down for a while to learn knitting and crochet. Today Lisa spins, knits, and blogs in Coralville, Iowa. She publishes her patterns through Ravelry under the name Fiber Tree Designs.